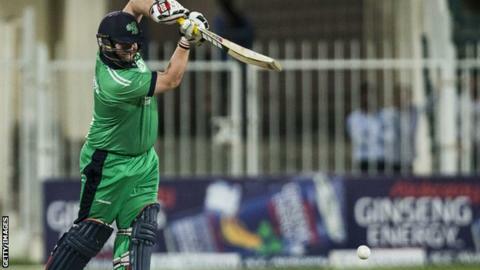 Paul Stirling's century steered Ireland to a 2-1 series defeat of Afghanistan with a five-wicket win in the final one-day international in Sharjah. George Dockrell (4-28) and Barry McCarthy (3-32) helped the Irish dismiss Aghanistan for just 177. Ireland cruised to the target in 38 overs with opener Stirling hitting 101 from 97 balls and Andrew Balbirnie adding a valuable 35. Afghanistan won the opener before Ireland levelled the series. Javed Ahmadi and Noor Ali Zadran put on an opening partnership of 34 before the wickets began to tumble in the decider. Spinner Dockrell and McCarthy, who took his first five-wicket haul in Thursday's win, did most of the damage as Afghanistan failed to set a competitive target. Ireland captain William Porterfield fell for just nine before a 62-run partnership between Stirling and Balbirnie laid the foundations for victory. Stirling followed up a fine 82 on Thursday with another impressive knock before he was dismissed by Rashid Khan. Gary Wilson (11) and Kevin O'Brien (10 not out) ensured they would be no collapse as Ireland eased to their target of 178.